In 1876, Nicholas [later named Nektary] arrived at the Optina forest with a bundle swung over his shoulder, containing nothing but a copy of the New Testament. Many years later, the holy father recalled his first impressions of Optina Monastery: "Lord! How beautiful it is with the sun flooding the area from sunrise, and the flowers! Just as though in Paradise!" Nicholas was received by none other than Elder Ambrose, and his initial dialogue with this great sagacious elder produced such a deep impression that he remained there for the rest of his life. Elders Ambrose and Anthony (Zertsalov) became his spiritual mentors. When he was in reclusion, Elder Nektary’s spiritual preceptors blessed him, after ten years of exclusive study of spiritual literature, to read secular authors and to study the secular sciences, obviously with the aim that he acquire that knowledge which would enable him to help lead the restless souls of the groping intelligentsia to salvation. He studied science, mathematics, history, geography and classical literature, both Russian and foreign. He spoke to his visitors about Pushkin and Shakespeare, Milton and Krilov, Spengler and Hegart, Blok, Dante, Gogol, Tolstoy and Dostoevsky. In his only hour of rest after dinner he would ask to have read aloud Pushkin or some fairy tales—either Russian or the Brothers Grimm. 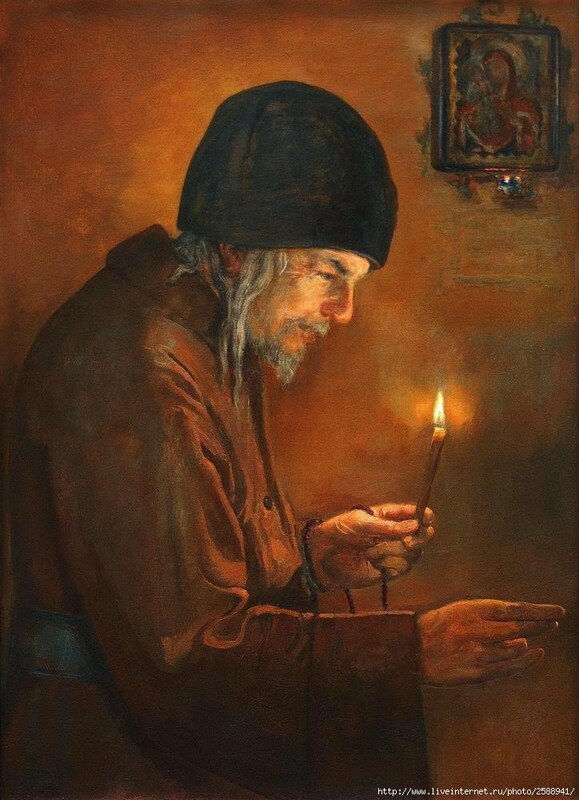 Starets Nektary became close to Constantine Leonti Bolotov, a scholar who became a monk living in Optina, and who used to read his original literary works to him. He studied painting under this academic and throughout his life maintained an interest by sketching icons and closely following new developments in trends and techniques. For example, his sketch of the Annunciation was made in the final year of his life at Optina. Having a talent for painting, this art was especially close to Starets Nektary. He used to declare, "Currently, the art of painting is on the decline. Previously, before commencing a painting a painter used to prepare himself – both internally and externally. Before sitting down to the task, he would prepare all the necessary items: canvas, paints, brushes etc... and would then paint not only a few days, but years, and sometimes a whole lifetime, like painter Ivanov’s ‘Appearance of Christ to the People’. Great masterpieces were created in those days. Today, painters work hurriedly, without thought or feeling… For example, when painting a spiritual work, it is necessary for the light to emanate from an angel rather than it fall upon him." The Starets badly wanted a painting to be done of Christ’s Birth. "It is necessary for the world to remember this enormous event. After all, it happened only once in the entire history!… The shepherds are dressed in short frayed clothing, facing the light with their backs to the viewer. And the light should not be white but slightly golden, be totally whole – not as rays or clusters – and only the far corner of the painting should be darkened, so as to remind us that it was night. In order to make it quite clear that this beauty was not human but heavenly and not of this world" added the elder with particular emphasis, "the light from the angels’ configurations must be soft, barely discernible." Another time the Starets mentioned to a girl: "Why were the shepherds worthy to see the angels that night? – Because they were vigilant." Once the elder was shown an icon, depicting Christ’s Transfiguration, where the light from Mount Tabor contrasted with the dark ganglionic trees in the foreground. The Starets ordered their erasure, explaining that "where there is light from Tabor, there is no room for darkness… When there is this light, every nook and cranny is illuminated." Regarding fine arts, the Starets had the following to say: "One can apply himself to the arts just as one would to any other activity, for example: carpentry or rearing cows. But everything has to be done as though in God’s view. There are major and minor arts. The minor one can be like this: there is sound and light. An artist is a person that is capable of comprehending these barely discernible colors, shades and inaudible sounds. He interprets his impressions onto canvas or paper. The results are painting, notes or poetry. Here, it is as though the sound and light are extinguished. Only color remains from the light. The book, notes or painting are in their own way, crypts of light and sound. Along comes a reader or viewer, and if he is capable of creatively reading or viewing, then the resurrection of purpose occurs. Then the circle of the art is completed. In front of the viewer and reader’s soul, the light erupts and the sound becomes worthy of his hearing. Consequently, an artist or poet has nothing much to be proud of. He is only doing his part of the work. It is futile of him to think that he is the creator of his works – there is only one Creator, while people only destroy the word and images of the Creator and then, receiving His power, enliven them. However, there is a greater art – the word that is enlivening and inspirational (e.g. Psalms of David). The path to this art lies through the artist’s personal deeds – it is a path of sacrifice and only one from many achieve their aim… All the verses in the world are not worth a single line of a Psalm… Pushkin was a very intelligent man but was unable to live his life correctly." These and other observations of Father Nektary were the fruits of his internal, spiritual experience. Having become Starets, he began to share with his visitors that which he acquired through reading and contemplation. The Starets loved to quote from Hamlet: "There are many things on earth, friend Horatio, that our wise men have not even dreamt of." He was talking about how it is essential for a writer to ponder over every word: "Before beginning to write, dip your pen into the inkwell, seven times." Recognizing the importance of the theatre as a source of influence on the community, Starets Nektary advised the artists to keep a sense of proportion in the game. He once refused to bless a young woman, aspiring to join the theatre. When asked about his refusal, he responded: "She will not be able to overcome the temptations and will become immoral… Modesty is of great worth; it is none other than a virtue of chastity. If a person safeguards his chastity (which is easily lost by the intellectuals) he safeguards everything."